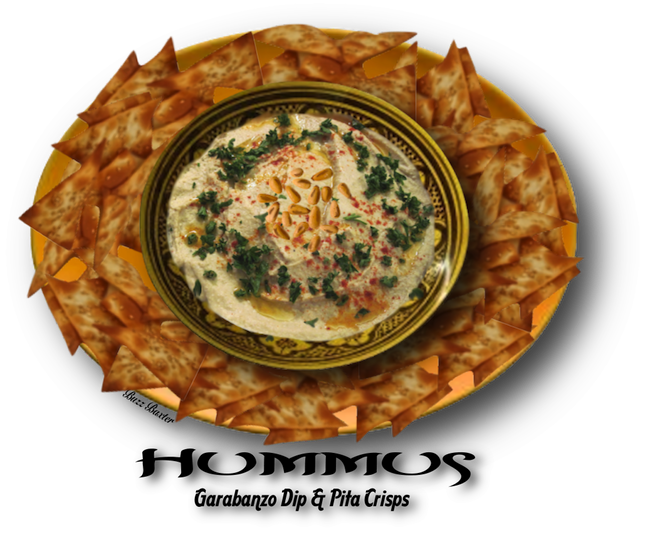 Hummus is probably the most popular appetizer/dip throughout all of the Mediterranean and the Middle East. From Gibraltar to India hummus is the universal dip. Easy to make, easy to serve and healthful as well. In the Middle East, where argumentative discourse is the rule of the day, The present controversy is over who invented Hummus. Since the Greeks have staked their claim on the discovery of Feta cheese, the Lebanese now claim Hummus for their own. Since they all at one time came from the same tribe, just who the hell cares! It is a known fact that inhabitants of that part of the World have been savoring it for thousands of years, just about as long as they have been fighting one another. On a lighter note, Hummus is a little heavier or thicker than normal dip, so break out the pita bread, pita crisps or chips or cruditès** (Strips of raw veggies, such as carrot or celery sticks for eating this dip. Enjoy! sieve. Garnish and serve with pita bread,  pita crisps or chips, or  cruditès**. pepper or fruits like pears and apples.